As rapid urbanization transforms India's landscape, doctors face a new set of challenges in protecting public health. Throughout the 20th century, familiar illnesses in India included communicable diseases such as malaria or typhoid, diseases affecting expectant mothers and newborns, and diseases stemming from inadequate nutrition. Shortly after the turn of the 21st century, the nation's disease burden shifted. Although communicable illnesses remain a daunting problem, the diseases most likely to cause disability and death now are noncommunicable, such as heart disease and diabetes. In short, India has made what health experts call the epidemiological transition - from a state of high mortality among infants and children, and epidemics affecting all age groups, to a state of diseases affecting primarily older individuals, such as hypertension. One part of the country where this transition happened early is in the southern state of Tamil Nadu, and particularly in the state's capital city of Chennai (formerly Madras), along India's southeastern coast. Mohan Thanikachalam, now based at Tufts University, was born in Chennai. He left home for medical training in the United States and returned a cardiac surgeon. Thanikachalam came home to a changed hometown facing a different set of health risks, similar to what doctors see in developed nations. He soon realized that, though surgical intervention can save a life, Chennai needed a public-health intervention to save many lives. Such an intervention would need data. "With cardiovascular disease, most of the data come from the United States or Europe," Thanikachalam said. "India has a completely different population." Heart disease and diabetes are often related to obesity. "But the population in India, at least the people I saw, they were not necessarily obese, so I was really surprised to see the extent of diabetes," he said. No one has all the answers as to why India's population has seen such a rapid increase in lifestyle disease, but something else has happened over roughly the same time period: urbanization. According to the World Bank, in 1960, India's urbanites comprised just under 18 percent of the country's population; in 2016, that number had climbed to over 33 percent. 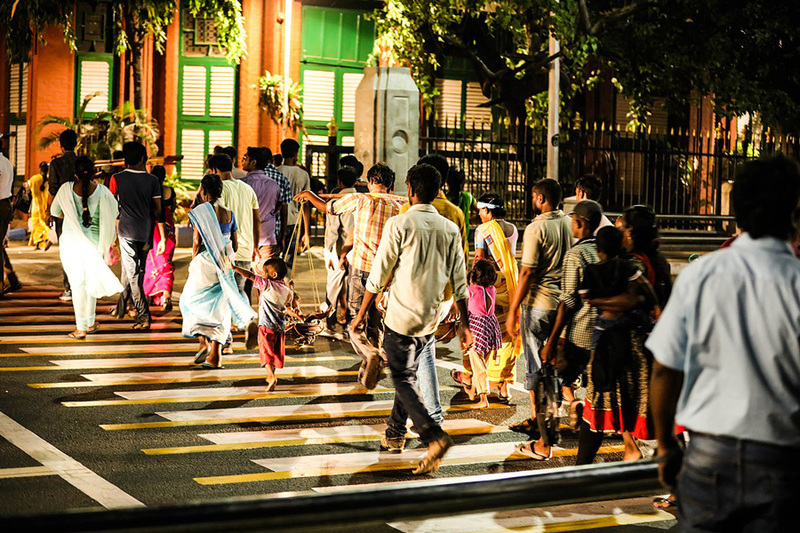 With a total population of over 1.3 billion, India now has an urban population of over 400 million. That is more than the entire population of the United States. Thanikachalam's hometown of Chennai currently has more than 7 million residents, and it is projected to top 10 million by 2030. Urbanization does not just change the landscape, it changes people's lives, starting with the air they breathe. "Pollution is one of the top risk factors for mortality in India," Thanikachalam said. He described other ways that urbanization affects residents. "We know that urban populations have higher body mass indexes, and they take in more calories. We also know they have lower physical activity. And we know they have higher stress levels. When we measure the level of anxiety, the levels are higher in the urban population." At present, researchers can only speculate about the causes of higher stress among city dwellers, but Thanikachalam suspects that social changes brought about by urbanization play a part. To get a better handle on risk factors for heart disease, Thanikachalam and some of his colleagues designed a study to assess the population's health. The Population Study of Urban, Rural and Semiurban Regions for the Detection of Endovascular Disease and Prevalence of Risk Factors and Holistic Intervention Study (PURSE-HIS) examined more than 8,000 people between 2009 and 2011. Researchers randomly selected study participants from Chennai and nearby semiurban and rural communities. Through a combination of home visits and clinic appointments, the study team assessed risk factors for future cardiologic and metabolic disease, as well as demographic and lifestyle factors. Participants underwent a battery of tests, including blood samples, urine samples, electrocardiograms (EKG), even treadmill tests. They also answered questions about physical activity and stress. The PURSE-HIS study provided a detailed snapshot of the population's risk factors. But to see how the landscape was changing, Thanikachalam embarked on a new study involving remote sensing. One of his collaborators was Kevin Lane at Boston University. With a background in biology, urban planning, and political science, Lane specializes in the study of how environment affects public health. "I've always been interested in the intersection between science and policy," Lane said. "In these places that rapidly undergo urbanization, you can actually see the changes occurring, and how that could potentially be associated with health outcomes." 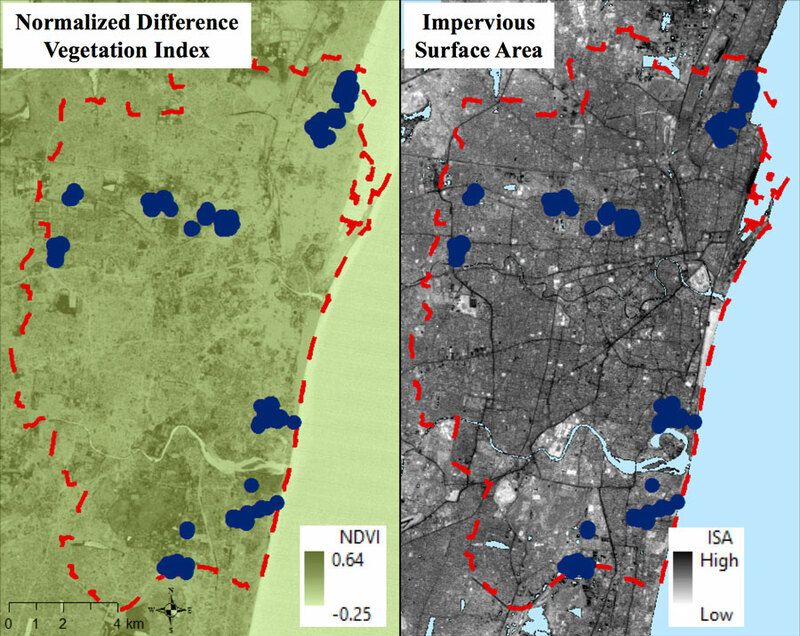 In addition to the results of the PURSE-HIS study, Lane, Thanikachalam, and their coauthors examined multiple facets of the physical environment in and around Chennai. They incorporated paved surfaces derived from Landsat 5 Thematic Mapper images acquired in February and May 2009. They estimated nighttime lights from a cloud-free composite acquired in January 2013 by the Visible Infrared Imaging Radiometer Suite (VIIRS) on the joint NASA/NOAA Suomi National Polar-Orbiting Partnership (Suomi-NPP) satellite, available from NASA's Level-1 and Atmosphere Archive and Distribution System (LAADS) Distributed Active Archive Center (DAAC) at NASA's Goddard Space Flight Center. And they examined greenness by incorporating two 16-day composites, acquired in February and June 2009, by NASA's Moderate Resolution Imaging Spectroradiometer (MODIS). This Normalized Difference Vegetation Index (NDVI) product is available from NASA's Land Processes DAAC (LP DAAC). Combining all the data sources, Thanikachalam, Lane, and their coauthors found that people living in more urbanized environments—with less vegetation, more paved surfaces, and more nighttime light pollution—had higher blood pressure. We all have a chronological age measured in the years, months, and days since birth. We also all have a biological age driven by the wear and tear experienced throughout life. Factors such as diet, exercise, air quality, smoking, and local environment affect biological age, which can outpace chronological age in unhealthy environments. An unhealthy environment can drive early vascular aging, which can lead to an early onset of cardiovascular disease. Lane and Thanikachalam's research supports a growing body of evidence that a reduction in vegetation around one's home can accelerate vascular aging. Such environmental changes can lead to other changes, such as less healthy eating habits, loss of social cohesion, and more noise and air pollution. Peter James, assistant professor at the Harvard Medical School Department of Population Medicine, who was not involved in this research, said, "Few prior studies have been able to examine so many objectively measured environmental factors in concert, and to link these data to objective measures of vascular function is unique. I know of no prior studies examining nighttime lights or impervious surfaces and cardiovascular markers." Lane and Thanikachalam consider this study one more step up a tall staircase, and they acknowledge the study's limitations. Lane explained that the NDVI data simply indicates photosynthetic activity. "But we're not able to easily distinguish the type of vegetation that people would have in these areas. It indicates amount of greenness around a person's home but it could be trees or bushes or grass," he said. "Another limitation of our study is that it's one snapshot, one point in time." Studies that follow human subjects and environmental changes over time will yield more insights. Further research might shed more light on the relationship between urbanization and physical activity, as the results from this study were surprisingly mixed. Perhaps the greatest drawback of the study was that the study unit was the household rather than the individual. Some household members, young males of working age in particular, are exposed to a microenvironment somewhere else. "If you don't take into account where somebody is spending significant amounts of time away from home, that's what's known as exposure misclassification," Lane said. Even partial insights can point to meaningful changes. In his original PURSE-HIS study, Thanikachalam examined the potential of two systems of medicine to intervene. One is modern Western medicine, and the other is Siddha medicine. Among the oldest systems of medicine in the country, Siddha is popular in southern India. As it can drive healthier lifestyle choices, it may provide an effective solution. "It's related to the culture," Thanikachalam said. "For an average 60-year-old Indian woman with diabetes hypertension, you'll probably get more buy-in by looking at yoga and a more traditional diet versus asking her to go to a gym and run on a treadmill. I think the way we are trying to approach it as the best of both worlds." Whichever treatment avenue prevails, early identification of risk factors and early intervention offer the most promise. Thanikachalam noted that 50 to 60 percent of the PURSE-HIS study population had high blood pressure and did not know it. As in the developed world, they showed no symptoms. "Once you get diagnosed with high blood pressure or diabetes, that's almost end-stage disease. It's very difficult to cure it," he said. "There should be more focus on earlier changes so that intervention can make a difference. Didan, K. 2015. MOD13Q1 MODIS/Terra Vegetation Indices 16-Day L3 Global 250m SIN Grid V006. NASA Land Processes Distributed Active Archive Center (LP DAAC). doi:10.5067/MODIS/MOD13Q1.006. India State-Level Disease Burden Initiative Collaborators. 2017. Nations within a Nation: Variations in Epidemiological Transition across the States of India, 1990–2016 in the Global Burden of Disease Study. The Lancet 390(10111): 2437-2460. doi:10.1016/S0140-6736(17)32804-0. Lane, K.J., E.C. Stokes, K.C. Seto, S. Thanikachalam, M. Thanikachalam, and M.L. Bell. 2017. 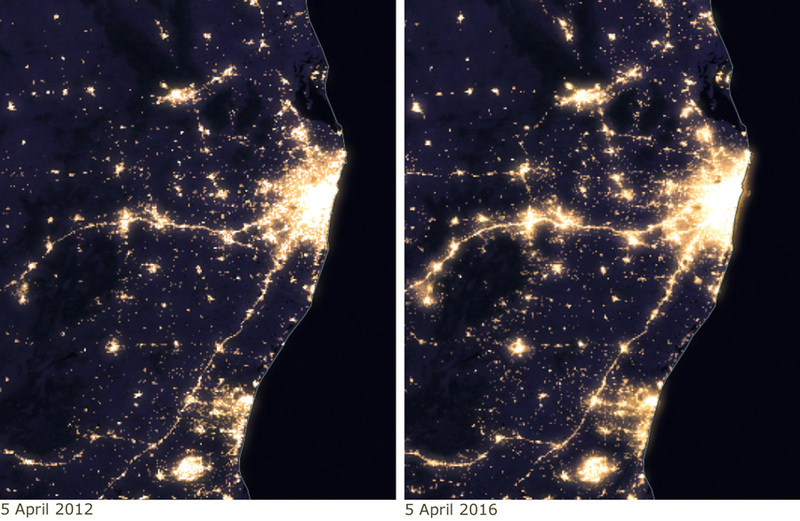 Associations between Greenness, Impervious Surface Area, and Nighttime Lights on Biomarkers of Vascular Aging in Chennai, India. Environmental Health Perspectives. doi:10.1289/EHP541. Prabhakaran, D., P. Jeemon, and A. Roy. 2016. Cardiovascular diseases in India: Current epidemiology and future directions. Circulation 133: 1605-1620. doi:10.1161/CIRCULATIONAHA.114.008729. Thanikachalam, S., V. Harivanzan, M.V. Mahadevan, J.S.N. Murthy, C. Anbarasi, C.S. Saravanababu, A. Must, R.R. Baliga, W.T. Abraham, and M. Thanikachalam. 2015. Population Study of Urban, Rural, and Semiurban Regions for the Detection of Endovascular Disease and Prevalence of Risk Factors and Holistic Intervention Study: Rationale, Study Design, and Baseline Characteristics of PURSE-HIS. Global Heart 10(4): 281-289. doi:10.1016/j.gheart.2014.11.002. VCST Team. 2016. VIIRS/NPP Day/Night Band 6-Min L1B Swath 750m. NASA Level-1 and Atmosphere Archive and Distribution System (LAADS) Distributed Active Archive (DAAC). doi:10.5067/VIIRS/VNP02DNB.001. World Bank. Urban population percent of total. https://data.worldbank.org/indicator/SP.URB.TOTL.IN.ZS?end=2016&locations=IN&start=1960.